We all know how delicious eating a keto diet can be. But one of the biggest questions people have is, “Is this keto?” At some point or another, we’ve all asked this while browsing the grocery store. To help you out I’ve compiled the ultimate keto diet food list with a free downloadable PDF, to help make your grocery shopping easier. You’ll find the printable food list link at the bottom of this post. 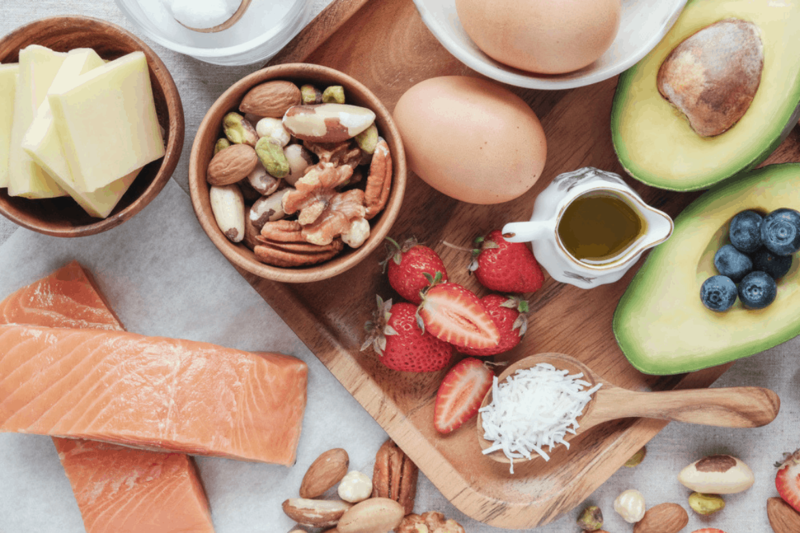 Whether you’re a beginner or if you’ve been eating this way for awhile, you’ll find this ketogenic diet food list will come in handy as a cheat sheet to reference. This way you can be sure that you are meal prepping with the correct ingredients and will have success on your low carb diet. For those of you just starting out, you’ll be so excited to find out how many amazing foods await you. This keto diet list of foods is designed to make your keto journey easy and painless. Before you go to the store just take a look at this list and you’ll know exactly what foods to buy. Note: If a food item has a “*” after it, these are foods that sometimes have sugar added to them. Always read the label & pick foods with no sugar added. A good rule of thumb is to stick to vegetables that grow above ground. These are less starchy and generally contain a higher fiber content. Below ground vegetables like carrots and potatoes are too starchy and are not good when you are trying to limit your daily intake of carbs. Of course there are exceptions, for example corn is an above ground vegetable but is highly starchy and should be avoided. Fruits are limited because they will make your carb count add up real quick. Berries are the best fruit to eat on a regular basis as long as you don’t have too many each day. If you are counting net carbs (carbs minus fiber), berries are great because they are a good source of fiber. You can pretty much pick any type of meat and cut. One thing to look out for is added sugar in lunch meat, bacon and hot dogs. Also avoid adding sugary additions to you meat like putting glaze on a home baked ham. Be sure to check the nutritional information of already marinated meat as it is often a sneaky source of sugar. Dairy is a great way to add fat to your diet and it’s best to stick with full fat options. Heavy cream is a little higher in carbs so don’t overdo it and plain milk should be avoided as it can be very high in sugar. Also worth mentioning, Greek yogurt is a better option than traditional plain yogurt because it has a lower carb count. Keto is a high fat diet so this is a very important section. The bulk of you calorie intake will come from fat as you want your body to fuel itself with fat instead of carbs. Some oils, like avocado oil, are better for cooking on high heat, while other oils break down with heat and lose some nutritional value. This article from Ketologic breaks down the best oils to cook with and the correct temperatures to use. Nuts and seeds are a great source of fat, but are higher in carbs, especially cashews and pistachios. They provide a lot of nutritional value, but you’ll want to make sure you aren’t having too many each day. Beans and legumes, like peanuts, should be avoided. Dressings and condiments can be tricky on keto. Always be sure to check the packaging to find out exactly how many carbs they contain per serving. You’re going to want to make sure you are sticking to lower carb and lower sugar options. There are plenty of ways to substitute traditional flour on keto. You’ll still be able to bake tasty treats as long as you are using keto friendly options like almond flour. Most herbs and spices are fine, just be sure to avoid premade spice blends. Buy individual spices and check the ingredients to make sure they are made of the pure spice with no sugar added. You can always create your own blends and control what goes in them. These are great if you’re trying to re-create some of your favorite desserts. A low sugar diet can still be very sweet if you stick to these options instead. To find out how each keto sweetener stacks up against each other and detailed pros & cons of each one, this post is quite informative. Avoid sugary drinks like soda and juices at all costs. There are sodas that use keto approved sweeteners that you can work in sparingly. Alcohol can be consumed, but you’ll need to stick to plain hard liquors and lower carb options like red wine, although some wine can be higher in carbs. Alcohol consumption can also make it harder to lose weight so it isn’t something you’ll want to consume regularly or in large quantities. These are items we couldn’t fit into other categories. For dark chocolate the higher the percentage the better and look for options that are sweetened with keto friendly sweeteners (Lily’s Chocolate is my favorite). Grab your free Keto Diet Food List!!! One helpful tip with this list is to highlight your favorite foods that you buy frequently. Hope this makes your keto meal planning a breeze! Comment below with any questions and let me know how you are doing on your diet!